On sale! 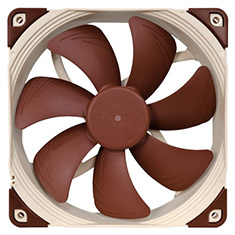 (normally $35) The NF-A14 is a premium quality quiet 140mm fan with a square frame that complies with Noctua's AAO (Advanced Acoustic Optimisation) standard. Its square shape and 140mm mounting holes (124.5mm spacing) make it ideal for use on watercooling radiators or as an upgrade for 140mm case fans. Featuring sophisticated aerodynamic design measures such as Flow Acceleration Channels, the NF-A14 further improves the renowned quiet cooling performance of the award-winning NF-P14. The FLX version provides 1200/1050/900rpm speed settings via the supplied Low-Noise Adaptors in order to provide full flexibility in fine-tuning the fan for maximum ventilation performance or near-silent operation. 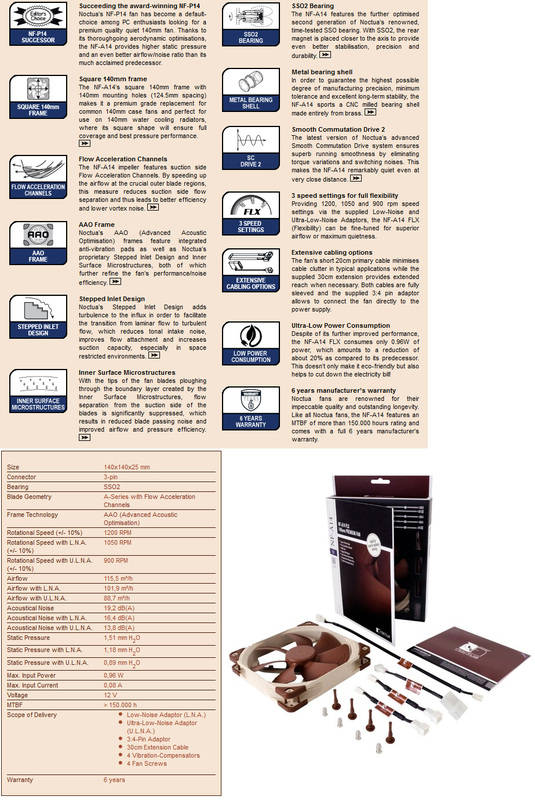 Its superb running smoothness, reference-class SSO2 bearing and Noctua's trusted premium quality make it an elite choice for the highest demands.